This test procedure was employed in the Foresight Ceramic Database and now is available for those having an account at Insight-Live.com. Accumulating test data using the variables defined in these procedures enables us to create tools that enable you to compare the physical properties of materials and recipes. Pyrometric Cone Equivalent is measured by making a cone of the material and firing it until it bends to 3 oclock. The cones are the size of small orton kiln-sitter cones and they are set into special refractory rings that hold them at the correct angle to bend inwards. A ring can hold many cones so many tests can be done in one firing. The ring is fired in a small kiln capable of cone 25-30 (clays that normally mature at cone 10, for example, might not melt until cone 20 or higher). When placing the ring into the kiln the placement of the cones is noted (to identify them) and the temperature at which each bends is recorded. These bars were fired at cone 10, they were straight when dry. The back one is a cone 10 Grolleg body, the front one is a cone 6 Grolleg body. 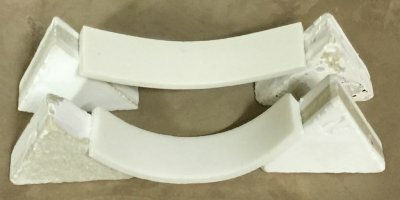 This simple test is valuable to determine susceptibility to warping in porcelains. If the pyro-plastic deformation is too much, for example, the weight of a handle will pull the round rim of a mug into an oval shape, for example. Learn to test your clay bodies and recording the results in an organized way and understanding the purpose of each test and how to relate its results to changes that need to be made in process and recipe. Pyrometric Cone Equivalent A measure of how refractory a material is. The measure is done by making a small cone from the material and firing it till it bends. A typical stoneware clay body, for example, might have a PCE of cone 20.